Heat Transfer PU Vinyl for making custom t-shirts, etc. Our soft, stretchy PU transfer vinyl are most popular for making custom T-shirts, sweatshirts, hoodies, cloths, etc. Here are the products you can order here. Just click the category link to see product specifications and price list. Attention: Heat Transfer Vinyl Remover (VLR 1020, HT-A016) is now available. It removes heat transfer vinyl and adhesive residue completely and instantly, and leaves no stains. It saves you time and money! This PU transfer vinyl is FDC Lumina 9000 series. It offers a sticky backing that allows user to stick back those pull-off bits during weeding. 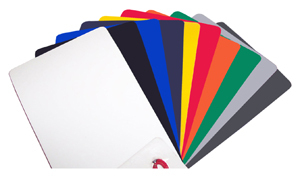 It can be used for imprinting graphics and lettering (such as player names and numbers, corporate logo). New colors: Tan (047) and Chocolate Brown (174). These 2 new colors have recently been added to this 9000 series. For more information about this series, you can view the Product Datasheet here. 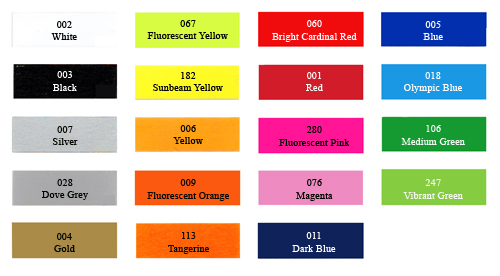 FDC Lumina 9001 Series is an opaque fluorescent colored heat transfer film designed for application to textiles. This product features excellent weeding capability for detailed designs, hot or cold peel for fast applications and opacity for multi layer jobs. For use on 100% polyester, 100% cotton, poly/cotton blends and uncoated nylon. FDC Lumina 9003 Series is a premium opaque colored heat transfer film designed for application to textiles. This product features excellent weeding capability for detailed designs, hot or cold peel for fast applications and opacity for multi layer jobs. For use on 100% polyester, 100% cotton, poly/cotton blends, plus nylon and leather. The key difference between this 9003 premium vinyl and the regular 9000 series is it can be applied to leather and nylon, while 9000 series works on uncoated nylon only. FDC Lumina 9004 Series is a very stretchable opaque colored heat transfer film designed for application to performance textiles. This product features excellent weeding capability for detailed designs, hot or cold peel for fast application and opacity for multi layer jobs. For use on 100% cotton, 100% uncoated polyester, poly/cotton blends, Spandex (or Lycra) and leather. The key difference between this 9004 series and the regular 9000/9001 series and premium 9003 series is it can be applied to Spandex and any very stretchy garment for its great stretchability. 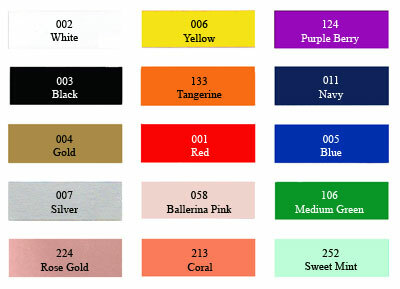 New colors: Navy (011), Ballerina Pink (058), Purple Berry (124), Coral (213), Rose Gold (224) and Sweet Mint (252). 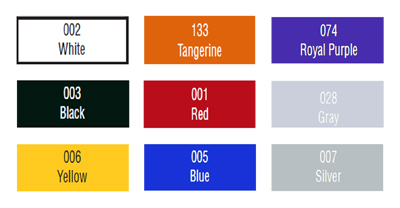 These 6 new colors have recently been added to this 9000 series. FDC Lumina 9010 Series is a heat transfer film designed to be applied at low temperatures for a short amount of time making it ideal for fibers that have low melting points or scorch easily in addition to traditional cotton, polyester and cotton-poly blends. This product features excellent weeding capability for detailed designs, hot peel for fast applications and opacity for multi-layer jobs. The adhesive of this vinyl film activates at 260°F (127°C) and takes only 5 seconds to bond. Thus it can be applied to many more types of fabric besides regular cotton and poly fabric. FDC Lumina 9107 Series is a metallic heat transfer film designed for application to textiles. This product features a pearlescent finish for vibrant designs. For use on 100% cotton, 100% polyester, poly/cotton blends, leather and sublimated polyester. 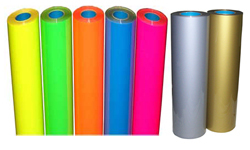 This PU film is designed for heat transfer of graphics and lettering to any color fabrics. It has very soft hand feel, stretchable and durable. Because the thick PET backing (or carrier) is no-sticky, weeding should be careful, hence it is usually for larger graphics. On the plus side, the weeded cutouts are stackable. But for detailed graphics, FDC Lumina 9000/9001/9003 series PU vinyls with sticky backing are recommended. 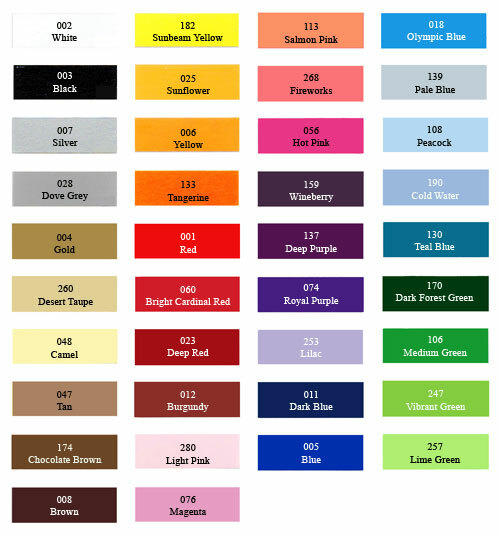 Regular color charts (left to right): white, black, royal blue, navy blue, yellow, red, orange, green, grey, dark grey. Specialty colors (left to right): neon yellow, neon green, neon orange, neon blue, neon pink, silver and gold.